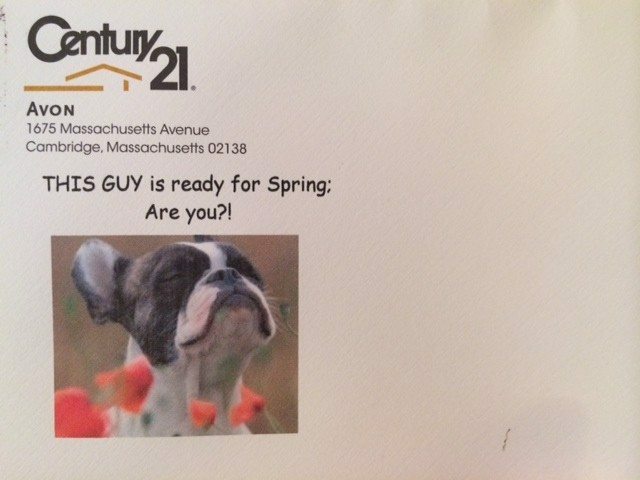 In an era when consumers are jaded by the come-ons and promotions that flood their mailboxes, blanketing neighborhoods with cookie-cutter advertisements may only offer limited returns for agents. 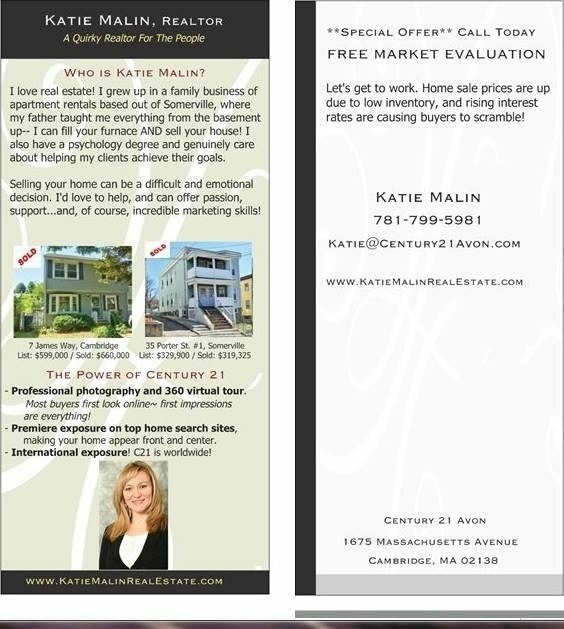 But don’t write off snail mail yet, says Katie Malin, an agent at Boston-based Century 21 Avon. She argues that if you treat envelopes and letters like an artist’s canvas, they can still bear fruit. 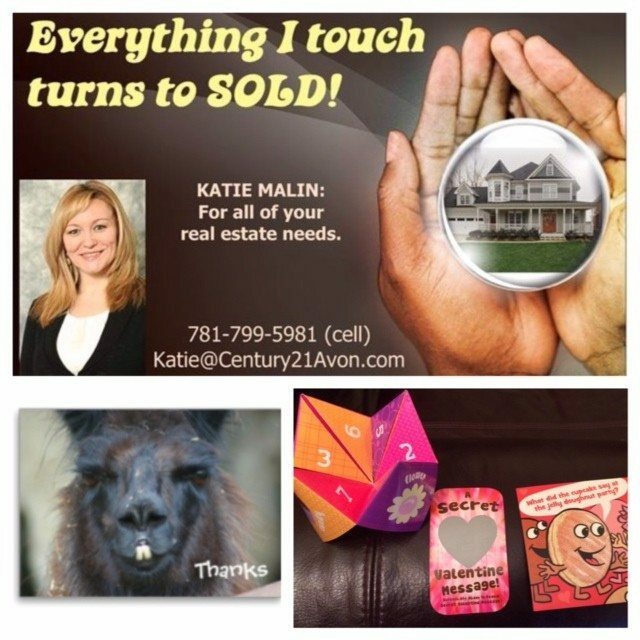 Several marketing items used by real estate agent Katie Malin. Malin purchased the camel greeting card on Zazzle, designed the “Everything I touch turns to SOLD” postcard on Vistaprint, and bought the Valentines in a local store. Malin, 29, takes a methodical approach to print marketing, churning out and mailing custom-designed materials with a creative bite to stay top of mind with former and prospective clients. To produce the materials, she uses the websites Zazzle and Vistaprint, her brokerage and her own artistic flair. She turned to Zazzle, a marketplace that lets users design personalized items, including T-shirts, posters and art, to cook up her latest marketing item: personalized stamps. “A lot of people are like, ‘Oh, is it legal?’” Apparently it is because Zazzle does them,” she said. She produced the stamps — which won her Inman News’ latest #madREskillz contest — by using a tool on Zazzle that lets you choose from a number of templates and add text and photos to them. The stamps aren’t exactly cheap, costing a $1 apiece. And it takes a little time to get the hang of Zazzle’s tool, Malin said. But overall she’s happy with the result, which she thinks will help her add some more pizazz to her letters. Customized postage stamp from Zazzle.com. Malin also uses Zazzle — which she describes as a “creative channel for people to go and be goofy and get themselves out there” — to obtain a staple of her print marketing repertoire: custom greeting cards. Malin browses the site to dig up cards that are quirky, or even baffling, and sends them to former clients or leads. The goal is to elicit a chuckle, maybe even a response. “I try and do things that’ll catch people’s attention … things that people will be like, ‘Who is this silly girl?’ and would hold onto,” she said. 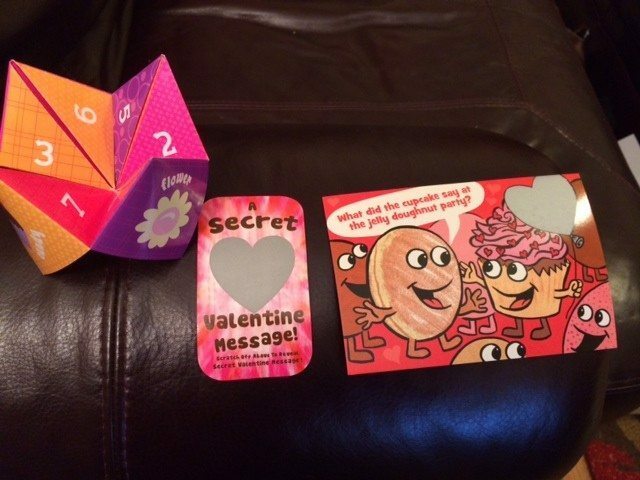 For Valentine’s Day, she recently fired off about 40 Valentines, including a few that require recipients to scratch off a black coating to view a punch line. Some of the Valentines that Malin recently sent former and prospective clients. The greeting cards help Malin maintain a rapport with contacts. To generate new ones, she uses Vistaprint, another marketplace for custom items. The website helps her design the colorful marketing brochures, postcards (she uses Zazzle for greeting cards and Vistaprint for postcards) and “rack cards” that comprise the bulk of the 500 or so letters she sends every week. “A Quirky Realtor For The People,” reads the tagline on her rack card. Malin recently purchased 2,000 rack cards for $195 on Vistaprint and 1,000 brochures for $171.99 using special coupon deals, she said. One of Malin’s rack cards. Adding another layer of kitsch to her prolific mailing campaigns, she sheathes her greeting cards and brochures in quirky envelopes. A pup seemingly reveling in spring weather appears on one of them. One of Malin’s custom-designed envelopes. 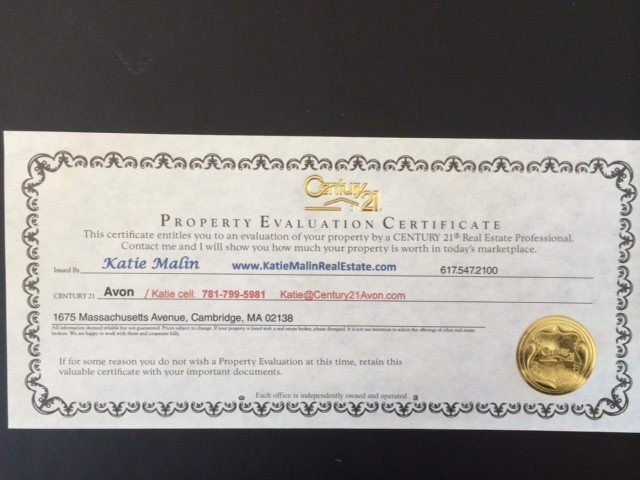 But Malin said none of these mail packages would be complete without one last crucial item: comparative market analysis (CMA) certificates. Think of Malin’s colorful marketing materials as lures. CMAs are hooks. One of Malin’s CMA certificates. She procures the CMAs from her broker, but adds a personal touch by printing her name, website, phone number and email on them. Malin said she appreciates having access to an array of marketing resources that help her reach past and future clients. So what do you do after you’ve spent the time and money producing colorful market materials? Consider using the U.S. 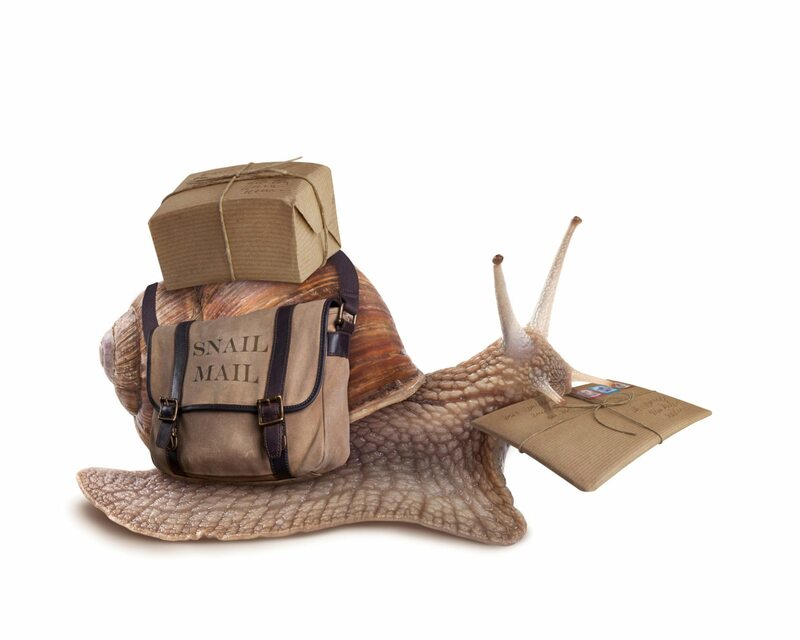 Postal Service’s “Every Door Direct Mail” (EDDM) service.